This 10th floor 1 bedroom offers almost 800 sq ft of living space with a large kitchen island separate dining area. Custom designed by Klever Living with curated furnishings including their proprietary mattress that is hand crafted in Virginia. 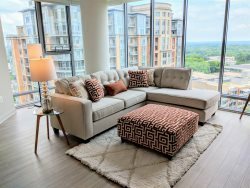 Enjoy outstanding views of the Tysons skyline from the floor to ceiling windows. Transportation is a breeze from Ovation. The new Silver Line Metro will zip you to downtown DC in 20 minutes. And you have easy access to all the major thoroughfares – I495, Dulles Toll Road and I66. There is a strict no smoking policy. Smoking (including e-cigarettes) are not allowed in the apartment, on balconies, in garages, at the pool, or within 20 feet of the property. Violation will include a $500 penalty and could lead to eviction. Parking is available in the secured garage for $5.00 per night per car.